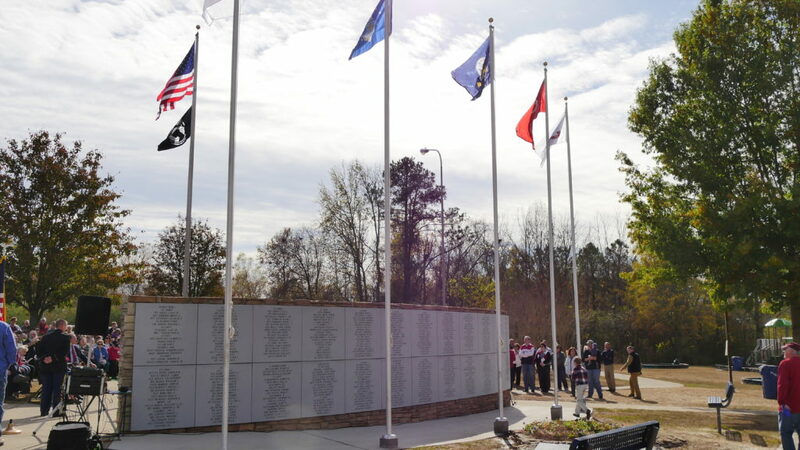 PHOTO: The new Rainsville Veterans Memorial features names of locals who served our nation in conflicts since World War II. 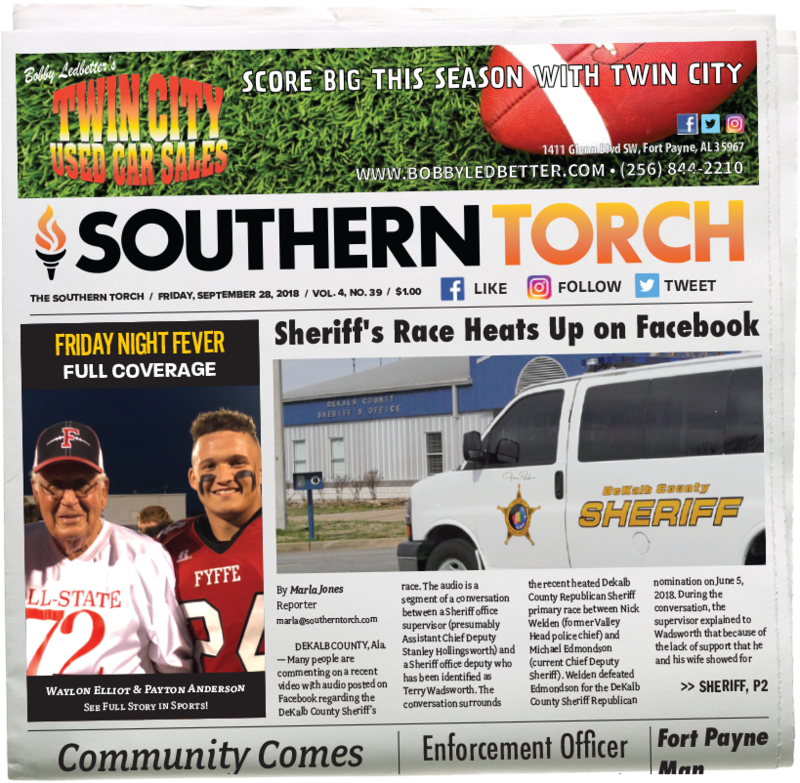 (Tyler Pruett | Southern Torch). 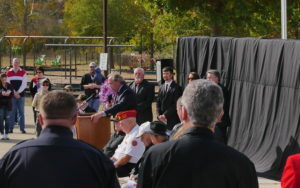 RAINSVILLE, Ala. — At noon today, the new Rainsville Veteran’s Memorial was unveiled to the public at a special ceremony in the Rainsville City Park. 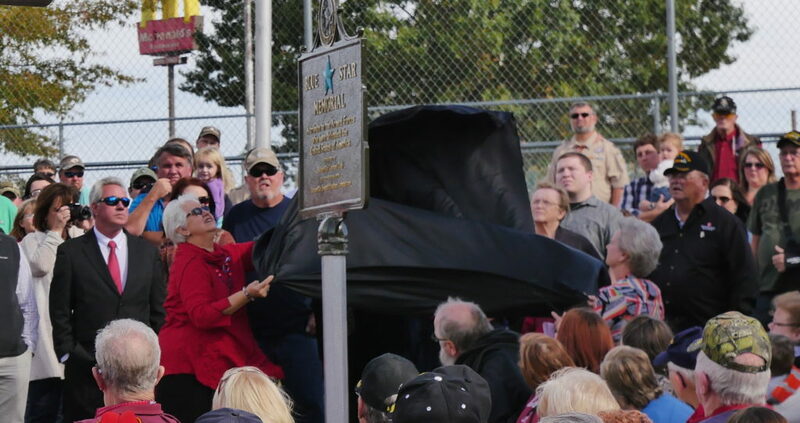 A large crowd from the community was on-hand to celebrate the new memorials dedication. City Councilman Derek Rosson MC’d the event. 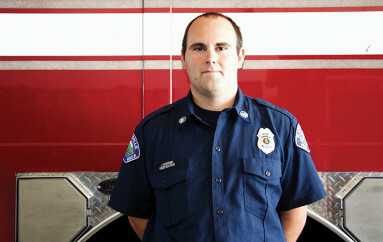 Rosson is a veteran and served two tours with the United States Marine Corps. 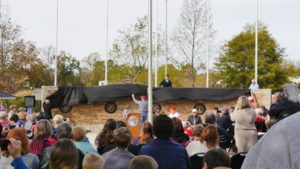 Rosson was inspired to build the memorial after seeing several others around the state and believed one would be an asset to the City of Rainsville. After meeting with the city council, Rosson was informed that he needed to set up a 501.3c, and because of all the red tape involved, the project never took off. 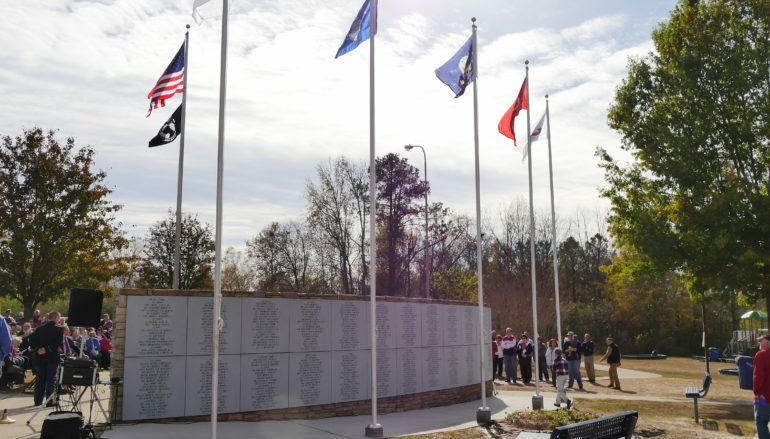 Kayron Guffey, Chairperson of the Rainsville Beautification Committee, had heard that Rosson had previously pursued building a Veterans’ Memorial in the city. Right before Memorial Day this year, Guffey contacted Rosson to see why the project never materialized. “She said, ‘this sounds like a good project for the beautification committee to work on,’ and when she said that, it fired me up,” said Rosson. 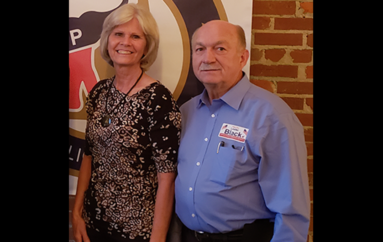 Rainsville Mayor Roger Lingerfelt, Representative Nathaniel Ledbetter, and Senator Steve Livingston also addressed the crowd. 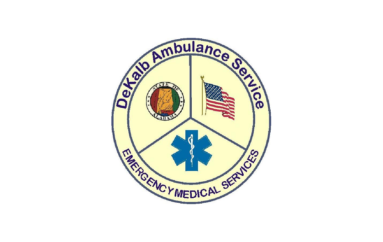 “We’re in the midst of heroes, thank you for your service,” said Rep. Ledbetter, in his remarks. “They are ordinary men, who have done extraordinary things,” added Ledbetter. 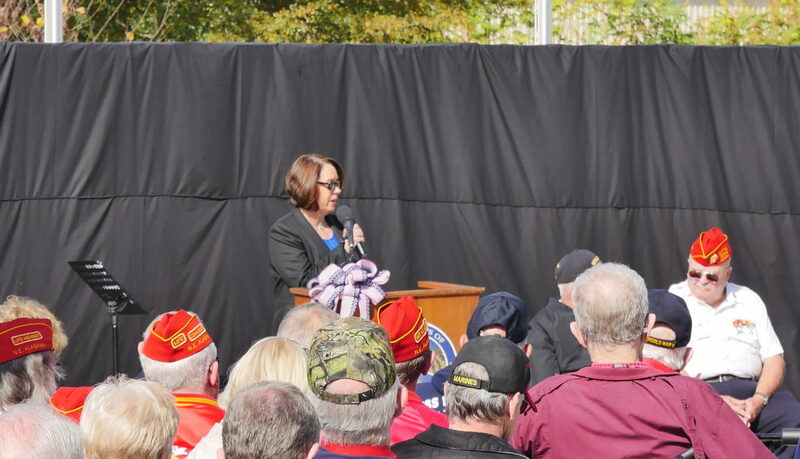 “The freedom to assemble, the freedom of speech, our freedom to vote….. these things would not exist without the sacrifice of our veterans,” said Sen. Livingston. “If it were not for our veterans, our lives as free men and women would be short lived,” Livingston said. “Happy Veterans day, and thank you for all you’ve done for America,” added Livingston. Funds for the project were provided by the beautification committee, the City of Rainsville, and private donors from the public. 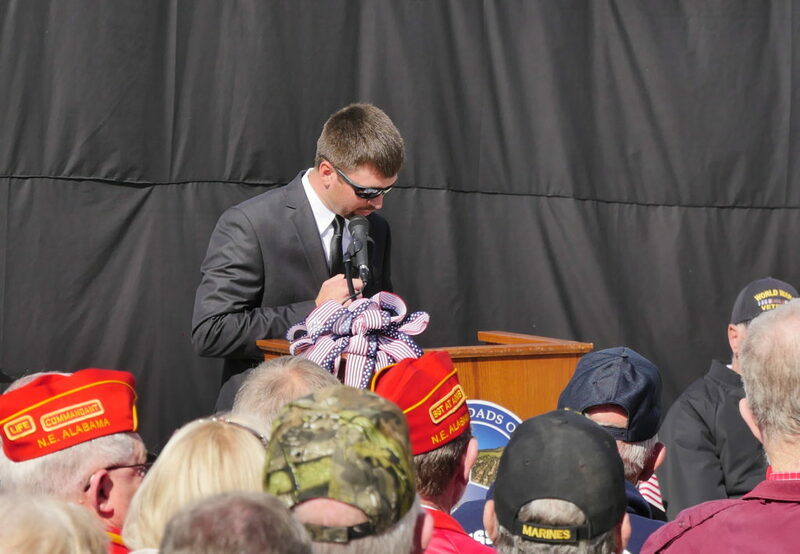 The labor was contributed by volunteers from the city and around the area who shared Rosson and Guffey’s dream of it’s own Veterans’ Memorial. Five flags are positioned at the back of the memorial, representing each branch of the armed forces. Each flag was raised by the oldest living veteran from the area of each branch. On the back of the memorial can be found the names etched of veterans from the area who served our nation during times of war. The names were submitted by friends and family. The new memorial shows what a community can achieve through coming together and when motivated by a great cause.